A low starting inventory level and below-average net injections of natural gas into storage contributed to working US natural gas stocks ending the refill season at this relatively low level. Getty Images photo. This article was published by the US Energy Information Administration on Nov. 15, 2018. 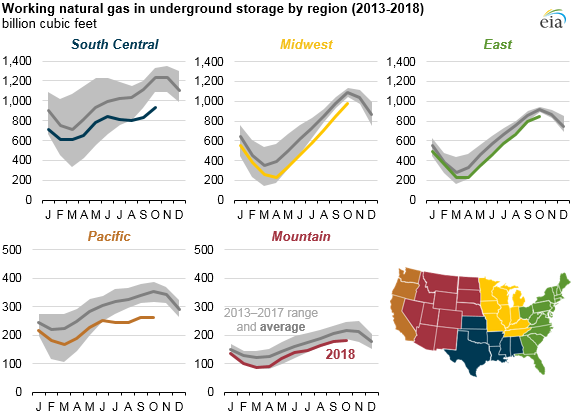 Working natural gas in underground storage in the Lower 48 states as of October 31, 2018, totalled 3,208 billion cubic feet (Bcf), according to interpolated data from EIA’s Weekly Natural Gas Storage Report released on November 8. 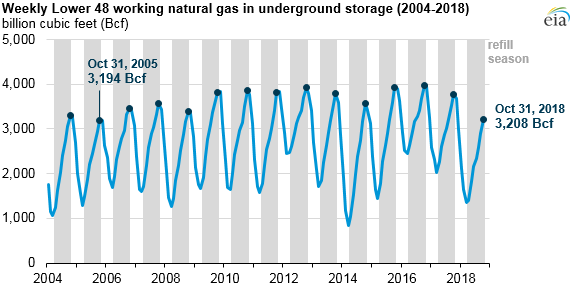 Source: U.S. Energy Information Administration, Natural Gas Monthly and Weekly Natural Gas Storage Report Note: Data for October 31, 2018, are an interpolated value based on the Weekly Natural Gas Storage Report. Inventory levels for the Lower 48 states and in each of the US natural gas regions ended the refill season at their lowest levels since October 2005, and these levels were considerably lower than their previous five-year averages. Although the natural gas storage injection, or refill, season is traditionally defined as April 1 through October 31, additional injections may occur into November. The South Central region saw the largest margin between the five-year range and working natural gas storage levels at the end of October, reaching 932 Bcf, 159 Bcf (15 per cent) lower than the previous five-year range. The Pacific saw the largest percent difference between the end-of-season levels and the five-year range, at 264 Bcf, or 54 Bcf (17 per cent) lower. Other regions were 3 per cent to 7 per cent lower than the previous five-year range. 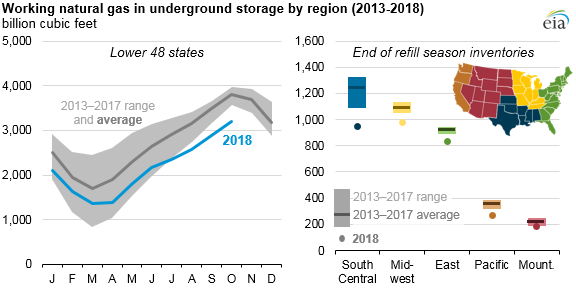 A low starting inventory level and below-average net injections of natural gas into storage contributed to working US natural gas stocks ending the refill season at this relatively low level. Lower-than-average temperatures in April 2018 resulted in uncharacteristic, continued withdrawals from storage during the month. Working natural gas stocks ended the withdrawal season this year on March 31 at 1,360 Bcf—the fourth-lowest level reported since 2005. Although net injections recovered in the following months, the net increases in working natural gas for the injection season were lower than the five-year average. From April 1 through October 31, 2018, EIA estimates that net injections totalled 1,848 Bcf. Injections were 269 Bcf (13 per cent) lower than the five-year average, despite being 97 Bcf (6 per cent) higher than injections last year. This level was the fourth-lowest net injected volume for the refill season since 2005. The South Central and Pacific regions posted the largest differences from the five-year average. In the Pacific region, net injections into storage fell 33 Bcf (26 per cent) lower than the five-year average. In the South Central region, reported net injections totalled 201 Bcf (39 per cent) lower than the five-year average with about 85 per cent of the shortfall occurring in the nonsalt facilities in the region. In the East and Midwest regions, net injections were each 18 Bcf lower than the five-year average (3 per cent). The only region that matched its five-year average net injections was the Mountain region. Despite increased natural gas production, increased demand for natural gas reduced net injections into working gas storage. Natural gas production averaged 83.6 Bcf/day during the refill season in 2018, compared with 74.7 Bcf/day in 2017 during the same period. However, greater-than-average power sector consumption of natural gas during the late spring and summer, combined with increased natural gas demand from US export markets, resulted in lower-than-average weekly net injections of natural gas into storage.